Welcome to the Web Site of Roos Instruments, Inc. The following terms and conditions (Terms and Conditions) govern your use of this Web site (the "Site"), and by accessing, viewing, or using the material on this Site, you indicate that you understand and intend these Terms and Conditions to be the legal equivalent of a signed, written contract and that you accept such Terms and Conditions and agree to be legally bound by them and to comply with all applicable laws and regulations, including U.S. export and re-export control laws and regulations. Roos Instruments makes no representations that materials at this Site are appropriate or available for use outside the U.S., and access to them from territories where their content is illegal is prohibited. If you are accessing this Site from outside the U.S., you do so at your own initiative and agree to be responsible for compliance with all applicable local laws. These Terms and Conditions will be governed by and construed in accordance with the laws of the state of California, without reference to its choice of law rules. If you accept these Terms and Conditions, you consent to the jurisdiction of the courts of the state of California and agree to accept service of process by mail and hereby waive any and all jurisdictional and venue defenses otherwise available. If you do not agree to these Terms and Conditions, you are not granted permission to use this Site. 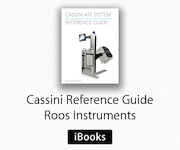 This Site is designed to provide general information about Roos Instruments' products, as well as support for such products that you may already own. We have made, and will continue to make, great efforts to provide accurate and up-to-date information. However, we make no warranty or representation, express or implied, that the information contained or referenced herein is accurate or complete. In addition, Roos Instruments shall not be liable in any way for possible errors or omissions in the contents hereof. We also reserve the right to alter the content of this Site in any way, at any time, for any reason, without prior notification, and will not be liable in any way for possible consequences of such changes. All materials contained in this Site are protected by law, including but not limited to, United States copyright and trademark law, as well as other state, national and international laws and regulations. Except as indicated, the entire content (including images, text and "look and feel" attributes) of this Site is ©1998-2018 Roos Instruments, Inc. All rights reserved. Roos Instruments also owns a copyright of this Site as a collective work and/or compilation, and in the selection, coordination, arrangement, organization and enhancement of such content. No commercial use of this content is permitted without the prior written consent of Roos Instruments. Unless otherwise indicated, trademarks, service marks and logos used and displayed on this Site are marks of Roos Instruments; use or misuse of these marks is expressly prohibited and may violate federal and state trademark law. Please be advised Roos Instruments enforces its intellectual property rights to the fullest extent of the law. If you download software from this Site, all use of such software is subject to the terms and conditions of the software license agreement that accompanies or is otherwise provided with such software. If no new software license is provided, then the terms and conditions of any existing, related agreement between Roos Instruments and your company shall apply to such software. You may not use such software unless you have read and accepted the terms of the related software license agreement prior to installation. THE MATERIALS AVAILABLE HEREIN ARE PROVIDED "AS IS" WITHOUT WARRANTY OF ANY KIND, EITHER EXPRESS OR IMPLIED, INCLUDING BUT NOT LIMITED TO THE IMPLIED WARRANTIES OF MERCHANTABILITY, FITNESS FOR A PARTICULAR PURPOSE, OR NON-INFRINGEMENT. ROOS INSTRUMENTS SHALL NOT BE LIABLE FOR ANY SPECIAL, INDIRECT, INCIDENTAL, CONSEQUENTIAL OR PUNITIVE DAMAGES, INCLUDING WITHOUT LIMITATION, LOST REVENUES OR LOST PROFITS, WHICH MAY RESULT FROM THE USE OF, ACCESS TO, OR INABILITY TO USE THESE MATERIALS. BECAUSE SOME STATES DO NOT ALLOW THE EXCLUSION OR LIMITATION OF LIABILITY FOR CONSEQUENTIAL OR INCIDENTAL DAMAGES, THE ABOVE LIMITATION OR EXCLUSION MAY NOT APPLY TO YOU. This Site may, from time to time, contain links to other Internet Web sites for the convenience of users in locating information and services that may be of interest. These sites are maintained by third parties over which Roos Instruments exercises no control, and accordingly Roos Instruments expressly disclaims any responsibility for the content, the accuracy of the information and/or quality of products or services provided by or advertised on these third-party sites. Use of the Internet is solely at your own risk and is subject to all applicable state, national and international laws and regulations. Although Roos Instruments has taken reasonable steps to protect the privacy of information transmitted through this Site, for example by requiring that all users must use a password to access the Site, please be advised that the confidentiality of any communication or material transmitted to Roos Instruments via this Site or electronic mail cannot be guaranteed, including proprietary information concerning your company. Consequently, Roos Instruments is not responsible for the security of any information transmitted via the Internet or otherwise communicated though this Site. For more private communication, you may contact us by telephone at 408.748.8589, or write to us at: 2285 Martin Avenue, Santa Clara, CA 95050, Attention: Webmaster. Roos Instruments welcomes your feedback and suggestions about how to improve this Site. Any ideas, suggestions, or any other material received through this Site will be deemed to include permission for us to adopt, publish, reproduce, disseminate, transmit, distribute, copy, use or act on such communications without additional approval or consideration, and you hereby waive any claim to the contrary.